1. We make recycling look good with our custom made litter receptacles. As a famous hot-spot for lunch and a popular tourist destination, the park produces a great deal of trash. blooming). Not only are these plants beautiful to look at (and they definitely make a great Instagram photo), but they absorb carbon dioxide released into the atmosphere. 3. 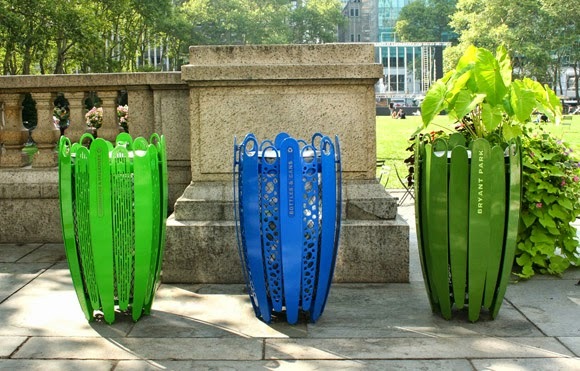 A love for shopping Bryant Park won't get in the way of your love for the environment. Not only are our baby and kids Le Carrousel tees adorable, but they are made of 100% organic cotton sourced in the U.S. We also reuse the park's retired canvas barricade covers and skate rink banners to make limited- edition totes with Urban Samaritan, a non-profit that provides homeless and in-need neighbors with job skills and paid work. Our Klean Kanteen bottles keep your water cold on those hot summer days and save hundreds of plastic bottles from ending up in a landfill. And our mahogany coasters are made from reclaimed wood from Le Carrousel! It's hard to say no to looking trendy while also going green..
4. The Green Roof in the middle of the park is porous and absorbs storm runoff. The lawn and gravel return water to the water table and aide in keeping the park green. How is our lawn a green roof, you ask? When it has a library beneath it, of course! 5. We don't use vehicles in the park. While some NYC parks rely on vehicles to transport staff and equipment, we do everything the old-fashioned way: on foot! This greatly reduces the park's carbon footprint. Fun Fact: The seating at the Southwest Porch and ping pong is made of excess skate ramps. Check out more at Loll furniture.